Our Young Learners Programme in Dublin is based at the quintessential Dublin school, Terenure College. Providing students with an exciting and inspiring learning environment. 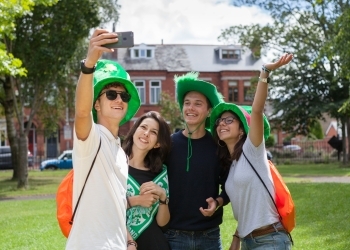 Students can explore the great attractions this enchanting green city has to offer, such as Stephen’s Green Park, Dublin Castle and the Medieval Quarter, to get a taste of its rich cultural heritage. Homestay provides a warm and comfortable home for students during their stay in Dublin and offers exposure to the English language, culture and way of life. EC’s accommodation staff visit all homes before they are accepted to host students, and follow up with regular home visits to ensure the comfort and safety of our students. Homestay providers are all located within a 45-minute bus journey of the Junior School. · The average travel time by bus to the school/city centre is 45 minutes, but this varies depending on the location of the homestay. Cereals, toast, fruit, tea, coffee. Packed lunch is provided by the homestay, consisting of a sandwich, fruit, and a drink is recommended by the school. Evening meal with the homestay. EC must be advised upon booking of any medical conditions, allergies or medications that need to be administered to students. Students must have adequate health, accident and travel insurance while attending any of our programmes, and this must be acquired prior to their arrival. European students travelling with a European Health Insurance Card (EHIC) are entitled to free public health care. All other students are required to pay to see a doctor should they need to, and a doctor’s visit costs approximately €60. If there is not a desk available in the bedroom, there will be a space provided in another room in the house for the student to study/work. All students will have access to a phone and will be allowed to accept incoming calls. If students want to make phone calls they must use a calling card. Calling cards can be found in many local stores. International Leaders accompanying groups are accommodated in twin rooms shared with another International Leader. If International Leaders request a single room, a single room supplement will be charged at the time of booking and reserved based on availability. Students will also be provided with access to living areas during acceptable hours. With advance notice EC can accommodate special requests (e.g., non-smoking family, no pets, allergies, special dietary requirements, etc.) Students should bear in mind that this may not always be possible. Valid reasons must accompany a request for a homestay provider change, and each request is considered on its own merits. Such changes are also subject to availability. Students must pay for all costs incurred, including transport, additional accommodation charges and cancellation fees (where applicable). The additional charges must be paid in full prior to the move. EC is happy to assist students with arrangements for any justifiable accommodation changes. Please note that there will be times during the programme when the students won't be supervised. Bed linen is provided, but students should bring their own towels. Linen and towels will be cleaned once a week by the homestay provider. Bedrooms and bathrooms will be cleaned once a week by the homestay provider. Laundry facilities will be provided by the family once a week. On the first day, all students will take a placement test, allowing academic staff to place students in the relevant group for their ability. In the afternoon, students will be given an orientation tour. All students must attend classes and activities on a daily basis unless they are genuinely indisposed (due to illness, for example). In the case of a student falling ill, an EC member will accompany the student to a doctor or A&E. Any EC student on the Young Learners Programme caught consuming alcohol during their stay risks being expelled from the school and repatriated to their home country. No alcohol consumption is permitted during the programme. Students are liable for any damage/breakages to school and accommodation property. If for some reason you will not be home for the evening meal, you should call your homestay providers before, and to let them know. In any of the above circumstances, the student will be informed that their stay is going to be terminated with immediate effect. Simultaneously, EC informs the student’s agent of the student’s behaviour and the course of action to be taken. The earliest flight available is booked at the student's expense and an EC staff member accompanies the student to the airport to ensure that the student leaves the country. Following such action, EC will terminate all relationships with the student and will be unable to take further responsibility for the student. No refunds will be given to any students who have been expelled. Students must attend all lessons and organised activities in order to receive their End of Course Certificate. The certificate will be given out on the last day of school. Students are liable for any damages/breakages caused to school property. Payment for damages must be effected immediately and the residence staff will not allow students to leave the residence unless payment has been made. A damage deposit form must be completed on the first day of school.